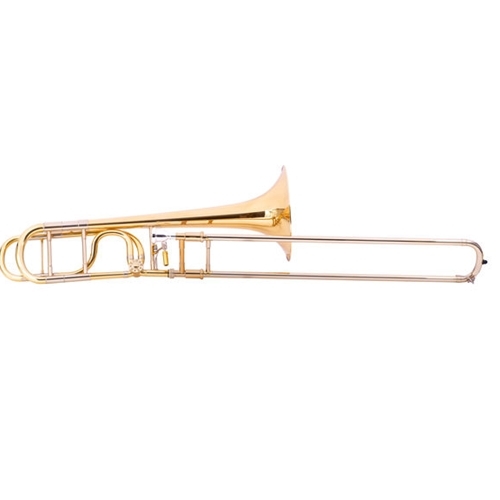 The JP233 Rath is John Packer's Bb/F Single Valve Bass Trombone and is suitable for musicians who are looking for a single trigger bass trombone. Lighter than the double trigger bass trombone, but with an equally broad sound. Developed in collaboration with UK trombone guru Michael Rath. This JP Rath design combines the simplicity of a single in-line rotary valve with a modern open wrap style. The development of the JP233 Rath saw the instrument finely balanced to ensure an excellent playing experience for musicians of all levels. The JP233 Rath features: .562" bore 9.5" bell Constructed from high grade brass throughout Exclusive Michael Rath design leadpipe which supports flexibility throughout the whole register Extremely high level of craftsmanship is apparent throughout, as is to be expected with instruments that bare the Rath seal of approval The quality of the JP233 Rath has caused a real stir in the industry with glowing reviews from many top players. Garreth Beckwith formerly of Grimethorpe Band recently described it as "a real winner of an instrument".